The idea for this recipe started to form in my mind almost a month ago now, shortly after I was at the EAT! Vancouver Festival. While there, I stumbled upon a company, Salt Spring Sea Salt, that hand harvests fleur de sel from the waters surrounding Salt Spring Island. They then infuse the sea salt with other, mostly locally obtained, ingredients. They have several products that captured my attention (ummm, it took all of my will power to walk away with only 6 different varieties), but their chocolate vanilla sea salt peaked my interest the most. I’ve been trying to create a recipe for it ever since. In addition to being inspired by infused sea salt, I also walked away from the festival wondering what exactly fleur de sel was and what made it different from other sea salts. With a little research I learned that the production of fleur de sel is very labour intensive which is why it’s one of the more expensive salt products on the market. Sea water is collected, filtered and then evaporated. During this process a thin layer of sea salt flakes forms on the surface. These flakes are then harvested by hand before they sink to the bottom. Traditionally from France, fleur de sel is now being harvested commercially in various countries throughout the world, including the West Coast of Canada. All this certainly gave me a new appreciation for the salt I was including in this recipe. But, really any sea salt would work well. This tart is rich and delicious. I hope you enjoy it! In a stand mixer, cream together the butter and icing sugar. In half cup increments slowly mix in the flour followed by the almond meal until well combined. The dough should pull itself into a ball. Evenly press the dough into the bottom and up the sides of a 9″ tart pan with a removable bottom. Bake for 15 minutes. Remove the pan from the oven and set aside to cool. In a sauce pan over medium heat, combine the heavy cream and Kahlua until you just start to see some bubbles around the outer edge of the pot. Add the chocolate and whisk the mixture together for about 1 minute. Remove the pot from the heat and continue stirring until smooth. Mix in 1 1/2 tsp of the sea salt. Set aside for 20 minutes. Upon cooling, pour the chocolate into the cooled crust. Sprinkle the remaining sea salt on top of the chocolate, then allow the tart to chill in the refrigerator for 1 – 2 hours before serving. This looks absolutely delicious!! love love salt and chocolate! Oh my Natalie…it looks like another winner recipe in your kitchen. I just love chocolate and could sure use a couple bites of this one! Thank you for re-blogging my post 🙂 Very much appreciated! Yum, I love sweet n salty, so this tart sounds like heaven!! Beautiful! Thank you, Jhuls. Happy FF! What a perfect combination of ingredients – I LOVE this! Oh wow delicious looking tart…. feel like grabbing a slice…. I love sweet and salty desserts, OMG, YUM! this little treasure of yours Natalie looks delicious. I’m also loving the fact that you press the pastry straight into the pie dish without having to rest it in the fridge, what a winner! Thanks for linking up with our Fabulous Foodie Fridays fun! Thank you 🙂 I’m much more of a cook than a baker. I just don’t have the patience, which is why I didn’t let it rest in the fridge, lol. It worked out very well. Wow this looks delicious. Who doesn’t love chocolate dessert? Thanks for sharing on Real Food Fridays. Pinned & twitted. Confession…after slicing the tart into little pieces, I then ate 3 of them, lol. Happy FF! 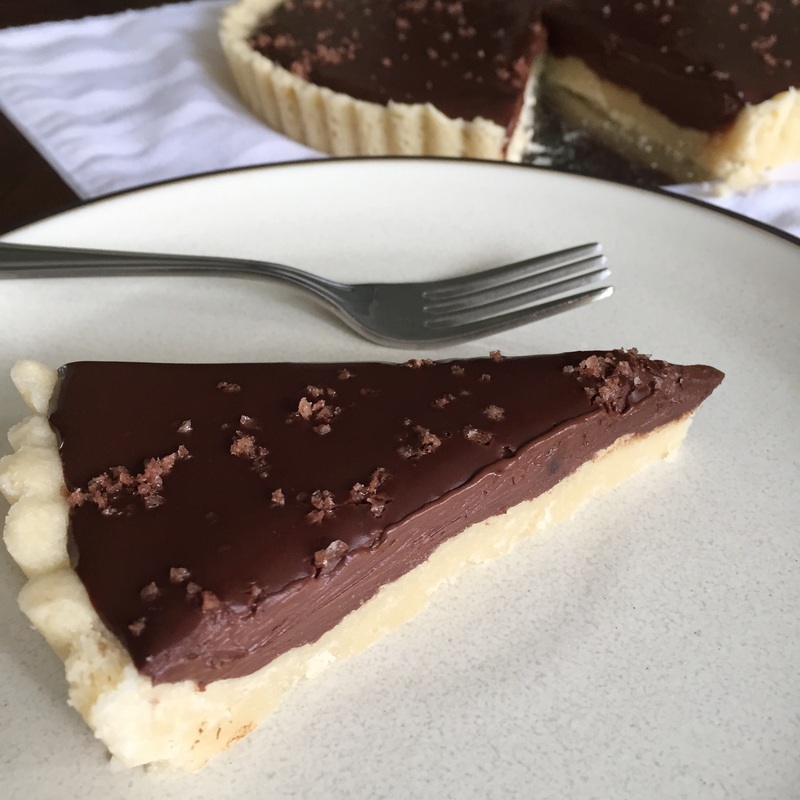 I thought I commented but maybe not – I am in love with this dreamy tart and the kahlua! It’s calling my name! Happy FF!